for jazz music, afrocentric vocalism and a strong use of Yoruba language to garnish his sound, and the message he spreads is Spirit and Life. OUN BOWA DARA (It will be well) is a song that professes positivity and goodwill to Nigeria at the state of transition and change in government. Olamigreat is optimistic that things will change for the better. Bose Ogunbiyi better known by her stage name “Abi Mega” is a Nigerian born Uk based; an International Gospel Artist, Double Award winner, performer, singer-songwriter and a Praise & worship leader. Abi Mega Sings in English, Yoruba, Ghanian, Igbo among other languages. As a singer, her achievements include PGMA Gospel Award in 2012 for Contemporary & African Praise Category and also International Award by Yoruba Heritage Award in 2014 for the ” Female Musician of the year UK” in Atlanta Georgia, USA and Double GXMMA 2015 Double Award winner for the “Female Artist of the year 2015″ and “Musician of the year 2015″. She has performed in many concert both Nationally and Internationally, Nigeria, USA, UK and others in churches, concert, Harvest, Wedding ceremonies, Birthday, official gathering and other places where her services is needed. Abi Mega releases “Danza [Oya Jo]” off her forth coming album titled “Dependable Father”. NEW MUSIC: YAHWEH – DABO WILLIAMS Feat Adeshewa, Jeremaih & PraizAddict. Gospel Music Future Stars |DABO WILLIAMS, ADESHEWA, JEREMAIH & PRAIZADDICT combines effort to bring us a dynamic, unusual and creative Worship Flow. From the High Place of the Earth, down to the lowest Place on It, #YAHWEH’s name is Chanted all Over the World, Yet he seats in Heaven and rules the Affairs of The World. Who can Compare to Him ‘ALAPANLA’ who divided the whole Red Sea with the Stretch of His Hand. He is The Ancient Of Days, Yet The Babies of Today acknowledges His Name. Your Grace Saw Us and Saved Us, Else we would have been in a Mess. Let this Melody From Our Heart Be accepted in your House Oh God. 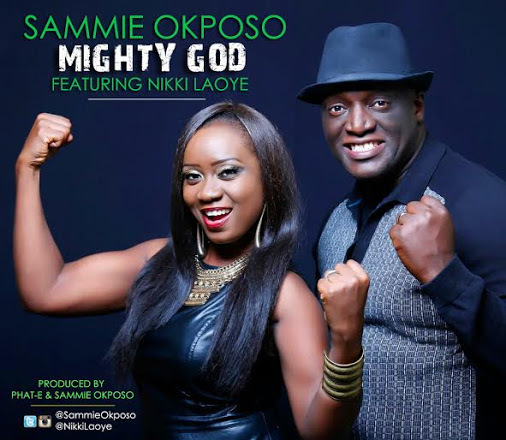 Multiple Award winning Recording Artiste & GLO Ambassador, Sammie Okoposo is a year older today – 30th May. In commemoration of his birthday, he releases a new single, “Mighty God”, featuring AFRIMA African Inspirational Artiste of 2014, Nikki Laoye. Produced by Phat-E and Sammie Okposo, the eccentric collaboration by the two industry greats and its popular catchy hook creates another fantastic praise anthem in honor of God’s goodness and faithfulness over the years..
St.Solomons is back again with this single ‘Rebrand You’. Produced by KOKES and 3SHELLS, it’s a Hip Hop track that highlights the Nigerian Problems, especially corruption which houses others. St Solomons brings out facts fearlessly, and also profers solutions to them all. The basic solution is individual image rebranding- say No to what is wrong! You are all implored to listen to this one, and let it get you reasoning in the light of making Nigeria a truly positively changed environment for standard living..
Like gentle ocean breeze, “I’m Alive To Worship” is a captivating soft rock music that will envelope your soul in delightful serenity. It was written and composed by Bamidele Gospel, a visionary worship leader and songwriter who desires earnestly to see God’s presence etched in the heart of worshippers with songs that radiate divine essence. “I’m Alive to Worship” is an anthem of the true worshipper; a song of a lover who longs to give all to the worship of the creator of heaven and earth. It’s a beautiful song underscored with simple rhythm and fitting for lovers of God and those who yearn to renew their commitment to Him. When sung genuinely from the heart, “I’m Alive to Worship” will draw God’s presence to your soul. With an end-chorus from a timeless hymn, this irresistible song would indeed garnish your musical library. On listening to “I’m Alive To Worship”, your aspiration to become an excellent worshipper will become a reality by God’s grace. You will be engulfed in true worship, and Yahweh’s face will beam on you again and again. Shedrack KC is a gospel artiste, songwriter. Shedrack Okechukwu Igwe started his musical carrier at age 11 as a drummer in his local church – Church of God Mission, Ogoja, Cross Rivers State. Five years later he graduated into playing the keyboard and then discovered that he had the talent to sing when he encountered an incident that led him to music fully. He is currently learning music production. OKAKA is his latest single and he can’t stop talking about the goodness of God in his musical journey and life so far. Sam Ladipo is out with the video to his hit gospel song titled ‘If You No Dance’. Sam-Ladipo is one of the Gospel Artists in Lagos, Nigeria, he began his music career right from the church as Alto, Tenor and Bass singer, He plays rhythm and bass guitar, He has served in different churches as bassist and choir director and also joined many Gospel groups as a singer and an instrumentalist. He is a song writer, producer and worship leader. He is talented, gifted, down-to-earth, filled with Holy Spirit and his sense of humour is incomparable. He has four albums to his credit, Wonderful God, Made Ready, Thank You and I am Not Alone, which is the current album in the market with 10 tracks. ‘If You No Dance’ is a song telling you to give the gift of dance that God has given you back to Him in appreciation for the wonder things he has done for you. In 2010, he stated his own music career as a solo Artiste to promote the gospel music, create a platform of excellence for African gospel singers and musicians, and popularise the superb gospel songs to populate the kingdom of God in Africa. Sam Ladipo featured Omolara Fatoki on this dance of praise song, and the video was shot and directed by Oluyinka Davids (iFocus Pictures). She is not your average 11 year-old and her video is definitely nowhere around average! As we celebrate children’s day, Ogheneyoma Azania Dodo, simply known as Yoma finally gives a date for the release of the video, for the smash hit single “Don’t Doubt the Lord” and whets out appetite with the video teaser. The single was released earlier in the month making it Yoma’s debut into the Gospel music scene. It caught on almost immediately, enjoying great reviews across various platforms. Most child-stars will opt for a simple plot, something that depicts their age grade but not Yoma. Sonorous with the voice, witty with the brain! She employs a dramatic plot to unveil a compelling story which will only be told with the release of the video. The video was shot on location in Dublin, Ireland and will be release on the 6th of June. Yoma is presently a member of the CACC youth choir and the St Teresa primary school choir – the Superstars. She aims to use her music to inspire and encourage people to trust in God, to worship and appreciate him. Pure Praises Mix tape is just a piece of the good things coming from God, the mix tape aims at giving people a sense of belonging, giving them a reason to stand up on their feet and put on their dancing shoes, singing hymns, and songs of praise rendered to God for life and provision. While embarking on a journey of taking gospel entertainment into a different dimension, Pure Praise blog decided to get dj wealth on the mix to deliver God’s message through inspirational praises by God ministers!